Dance practice for the 2009 Senin show. Francis and Papa play the drums for the youngest Gboze dancers, Kevin and Brian. 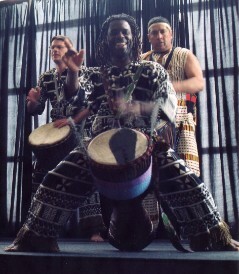 Francis plays for Zaddy (dressed in Kente cloth), a visiting professor from the Ivory Coast at the Lalea show - 2010. Francis, Papa, and Abel in Boloye.